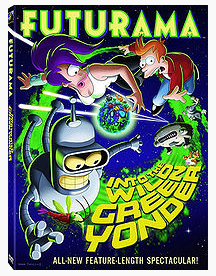 I recently watched a video that was made directly for DVD release called Futurama: Into the Wild Green Yonder. The movie was great not just because it provided the typical humor and creativity that one can expect in the regular Futurama programs, but also because it dealt with the serious topic of land preservation vs development. In the animation, this was achieved by an elaborate plot dealing with the father of one of the regular Futurama character's (Amy). He is plotting to rebuild Mars Vegas into an interplanetary "mini" golf course which finishes on a rare "virgin land" planet that has some of the rarest animals and plants in the galaxy. Although I am simplifying here, the story becomes a quest of sorts for the characters to save the planet from development. What is worth noting here is that in this treatment of the subject, in order to identify the need to preserve the natural land and associated wild life- they needed to also identify the "trouble maker" or direct cause of that problem being developers. While in this particular scenario the developers were creating a needless and somewhat questionable theme park, in reality the problem is more complicated. Sometimes land clearing/ loss etc. is done to make way for more prosperous development opportunities - for example housing, eco- tourism, park or recreational land. I think that it is important to say that this issue is not monolithic and that is why I am leaning towards making a game- not an animation- to show that there are sides to every issue. Maybe the solution to recognizing this issue is to not make a linear "narrative" with a correct course of action but maybe having different endings that would allow players to come into a potential in- class discussion with different views that would assist a dialogue.